The Dalai Panda is 6 reels and 27 to 729 paylines video slot game powered and developed by iSoftbet software platform. Total coins for the game are 20. You can play this slot machine using your mobile devices as well as desktop for coin sizes of 30 p per spin to up to £€30 per spin. You can win up to 1000 times on your total bet, while playing this video slot. You can also receive up to 20 free spins during free spin bonus feature and up to 2x of multiplier. This video slot is themed on Asia and religious points. The game starts within 3×3 reel sets. The reels of this slot game are being set against a backdrop of mountain. The reels of the game includes symbols such as fish, birds, A to J playing cards, turtles and monkey. The green plant is the wild symbols of this game which replaces all other symbols except the bonus. The game has a bonus symbol in the form of yin/yang. If the bonus symbol lands on 4 reels then you will get 10 times of your total bet, while 5 symbols will give you 20 times and 6 of these symbols will offer you 33.33 times of your total stake making it a smart move. The Free Spins Bank is located in the game in the form of a gold pot and it starts at 5. 1 free spin is added to the pot on every time you land a winner on both set of 2×2 reels set during the base game. 3 of more of the Bonus symbols across a payline will activate the free spin feature. 2 Bonus symbols will get you 2 free spins, 3 will give you 5 and 4 bonus symbols will give you 10 free spins. Just like that 5 bonus symbols will give you 25 free spins and 6 bonuses will give you 50 free spins. 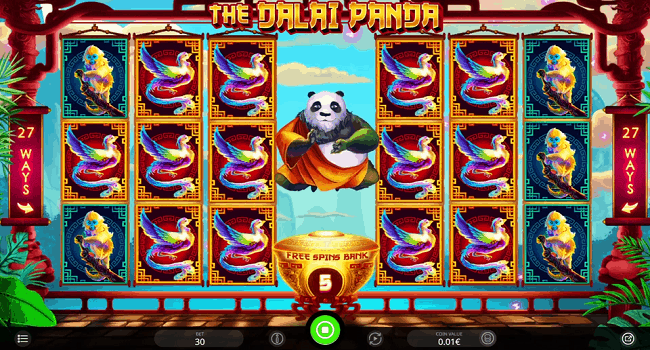 The Dalai Panda is a very good slot game which contains cartoon style visuals as well as Asian backed track. If you want to play Dalai Panda slot machine for real money then check out iSoftber online casino for the same.